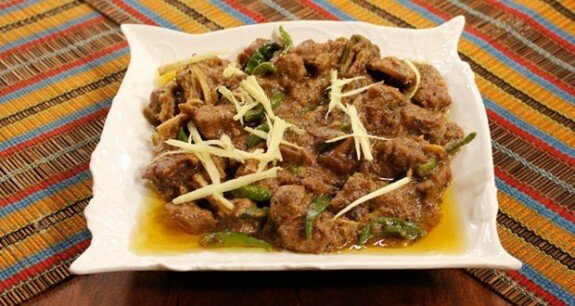 A sub-continental mutton specialty with strong ginger flavour for your main course. A spicy cuisine made in classic Pakistani style for meat lovers. Please rate our recipes on the recipe page or let us know your opinions in comments. Urdu recipe can be requested in comments. Take a bowl and beat yogurt. Put chopped onion, chopped ginger garlic, chopped tomatoes, papaya paste, crushed black and red pepper, salt, lemon juice. in the yogurt. Then add mutton to this mixture and marinate it for 1 hour. Take out marinated mutton in a pan. Cover with lid and cook it on low flame for 30 minutes. Remove the lid from the pan and add all the spices, grinded green cardamom, mace and oil. Fry well (bhoonain). When oil comes on top and meat is tender. Take it out in a platter and serve garnished with ginger slice, green chilies and mint.